Gerbera Designs is the garden design company which will help you to create and maintain your dream outdoor space in Aberdeen City and Aberdeenshire. Can’t afford to move but want to increase the value of your property? Have a busy work and family life and don’t have time for your garden? Not sure which plants are suitable for your garden? Then Gerbera Designs can help. We offer FREE initial consultations in Aberdeen City and Shire. 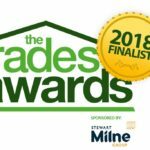 Gerbera Designs has been shortlisted again as finalists in the 2018 Trades Awards– category Garden Design & Landscaping. Thanks to all our clients for their support and also to our plant nurseries and landscapers who have worked with us over the past few years. We couldn’t have done it without you! Please take a moment to have a look through the rest of my website. I work with local landscapers, builders and nurseries to realise your dream garden. I also run a children’s gardening school called Gardening4Kids aimed at pre-schoolers and primary school children. Please check out the Children’s Gardening School page for further details. Whether you want a family garden with play areas for the children, somewhere to relax with friends on long summer evenings, a wildlife garden or a relaxing space to grow fruit and veg then I can work with you to create a garden tailored to your needs and lifestyle. There are many gardens open to the public in North East Scotland which can offer you inspiration for your own patch. I provide photos and website links so that you can find that inspiration you have been looking for!